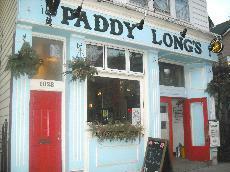 PADDY LONG'S BEER AND BACON PUB is known for their beer and bacon tastings which are held every week. You really haven't lived until you have attended one of their pig roasts. They baste the pigs in Austrian Pilsner and bacon fat. Just reading it is enough to make your mouth water. Now this is a unique pub that is really worth your time! It looks like a dive bar on the outside which may make you apt to skip it, but the inside is very nice, so don't judge this book by its cover (or this bar by its exterior!) Lots of great daily specials to keep you coming back for more!